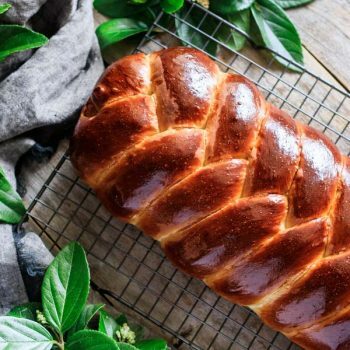 Learn how to make easy challah bread with this delicious recipe. This soft, sweet bread is made with honey and olive oil. 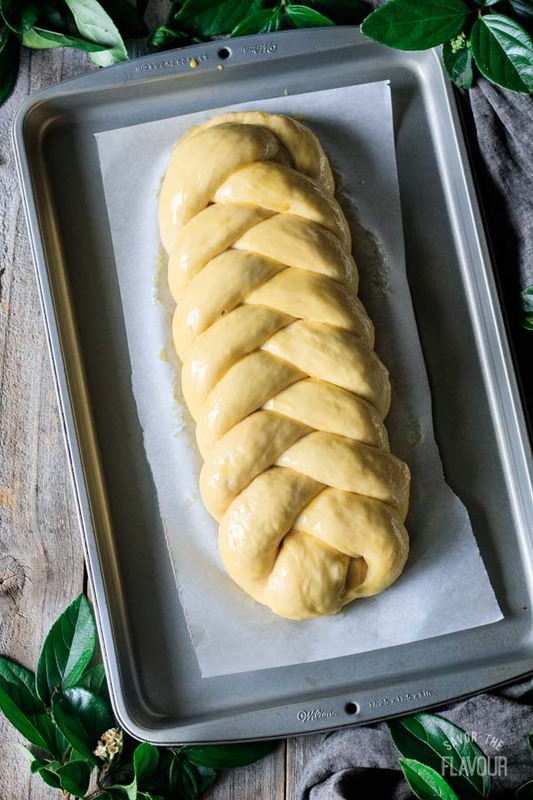 It’s surprisingly simple to braid the 5 strands of challah dough into a stunning centerpiece for an Easter brunch or a Jewish Sabbath meal! This recipe was originally published on March 27, 2018. What is a challah loaf and what does it symbolize? Challah is an enriched Jewish bread that’s traditionally braided and served on the Sabbath. Many things about the loaf are symbolic; for example, the braids represent love and unity. What country does challah bread come from? The exact origins of challah bread are unclear, but most people agree that modern challah started in Eastern Europe during the fifteenth century. Why is challah bread round for Rosh Hashanah? The round challah loaf made for Rosh Hashanah is shaped to look like a turban and represents the cycle of the new year. The pleasure of a 5-star review on this recipe would be much appreciated. Please leave your review after the recipe card. What is the difference between brioche and challah bread? Most brioche recipes contain butter and milk, while challah bread contains no dairy products to make it kosher. (Jewish dietary laws forbid eating meat and dairy products in the same meal.) Challah gets its beautiful fluffy texture from eggs, olive oil, and honey. Is challah bread the same as egg bread? Yes, challah bread is the same as egg bread. The latter is simply an alternate name for this soft, fluffy bread. 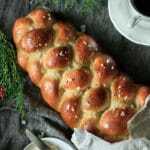 Challah bread has a beautifully soft and fluffy texture with a hint of sweetness from the honey and richness from the eggs. What is challah bread similar to? Challah has a similar flavor and texture to many other sweet enriched breads, like brioche, milk bread, or even Hawaiian sweet rolls. Challah bread is made with olive oil instead of butter, and contains eggs, which increase the protein. 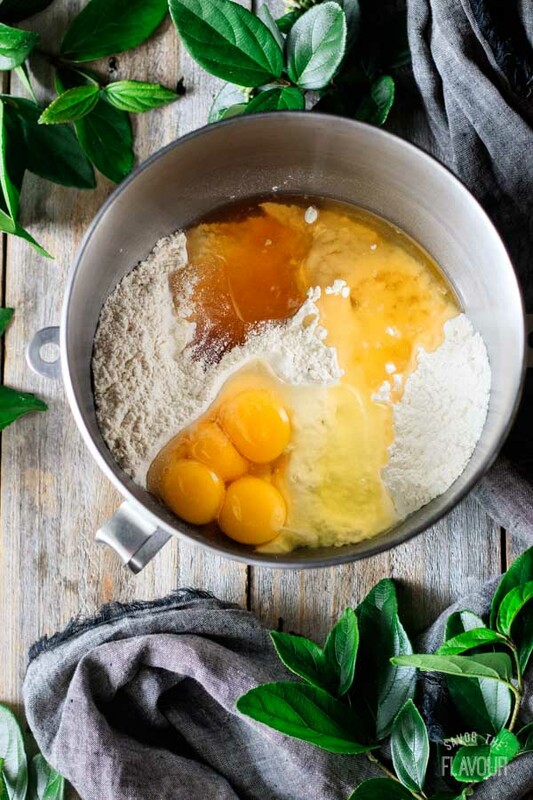 You can make challah healthier by substituting part of the bread flour for whole wheat flour; just realize that it will make the bread denser and more earthy tasting. Scroll down to the bottom of the recipe to read the nutrition facts for this recipe. Why is challah bread braided? 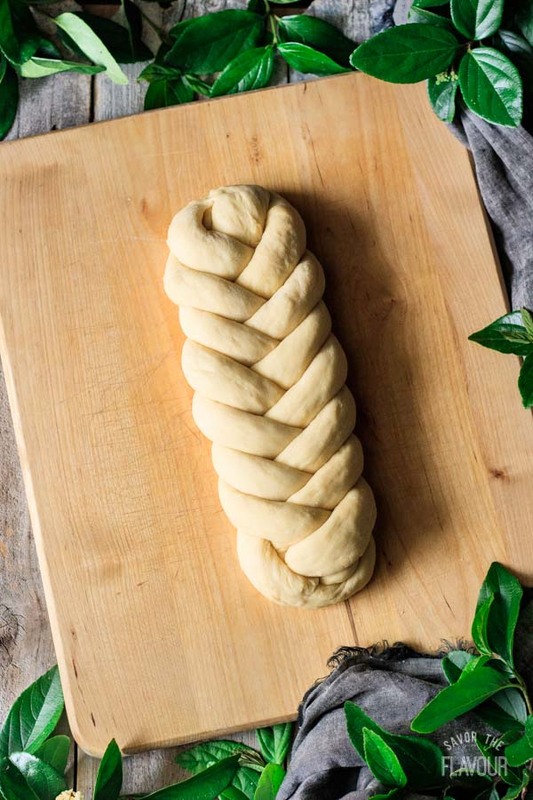 The braids of challah bread represent love and unity. The number of strands in each braid also has symbolism: for example, a three-strand braid represents three commandments God gave regarding the Sabbath. A twelve-strand braid represents the twelve tribes of Israel. 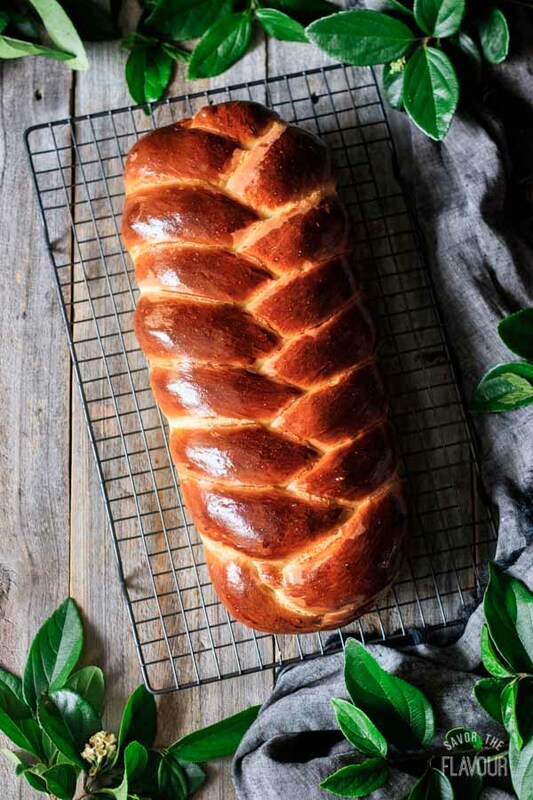 Braiding challah bread can be as simple or as complicated as you like! I chose a simple 5-strand braid for this challah recipe, so that’s what I’ll demonstrate in the photos below. If you want to try another style of braid, check out this video to learn how to braid 3-9 strand braids. 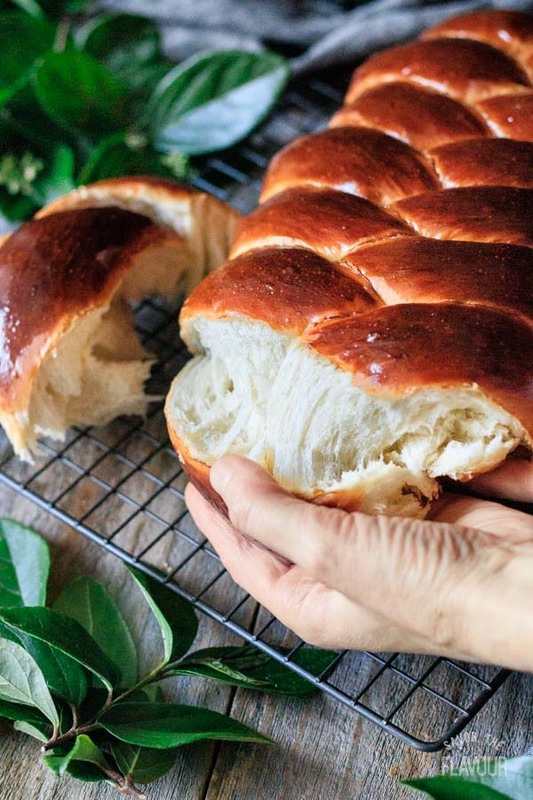 Want to do a 4-strand round loaf for Rosh Hashanah? Check out this tutorial. Divide the dough into 5 pieces, then roll each one into a 20-inch rope. Make sure all the ropes are the same length. Lay the ropes beside each other. Divide them into one group of 2 strands and another group of 3 strands, keeping the strands touching at the top. Cross the 5th strand over and lay it beside the 2nd Then, cross the 1st strand over and lay it beside the 4th strand. Repeat until the whole loaf is braided. Tuck the excess under the ends. Then, the bread is either torn or sliced, depending on rabbinic tradition. (Not using a knife reminds us to keep the Sabbath peaceful and also brings to mind when God stopped Abraham from killing his son, Isaac, with a knife.) Salt is traditionally served with the challah bread to remind the partakers of the Temple offerings. What goes with challah bread? My favorite topping for challah bread is softened, salted butter. It really enhances the bread’s sweetness and rich flavor. How many slices are in a challah loaf? It all depends how long your loaf is! If your challah loaf is 15 inches long, and each slice is ½ inch thick, you’ll get 30 slices. How do you heat challah bread? Oven Method: wrap the bread tightly in aluminum foil to prevent it from drying out or burning, then bake at 350 F for 10 minutes or until warm. Microwave Method: this works best for individual slices or chunks of challah, not the whole loaf. Microwave on high for 10-20 seconds, until desired temperature is reached. Can I make challah bread ahead of time? 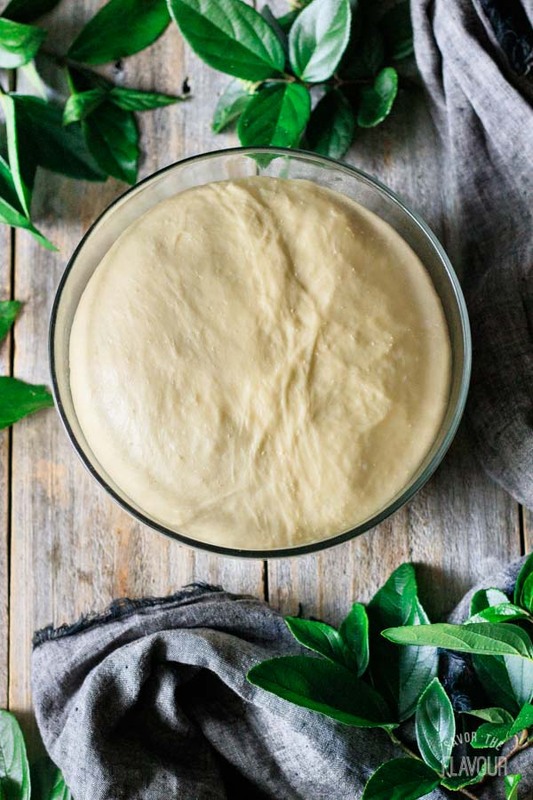 You can make the dough the night before and let it rise in the fridge overnight. Shape and bake the dough the next day. Fully baked challah can keep at room temperature for a few days, but it tastes the freshest within 24 hours after baking. Defrost challah by letting it sit at room temperature for 5 hours or so. Don’t refrigerate the bread, as it will go stale very quickly in the fridge. It’s not recommended to freeze unbaked challah dough. The defrosted dough won’t rise as high as freshly made challah dough. 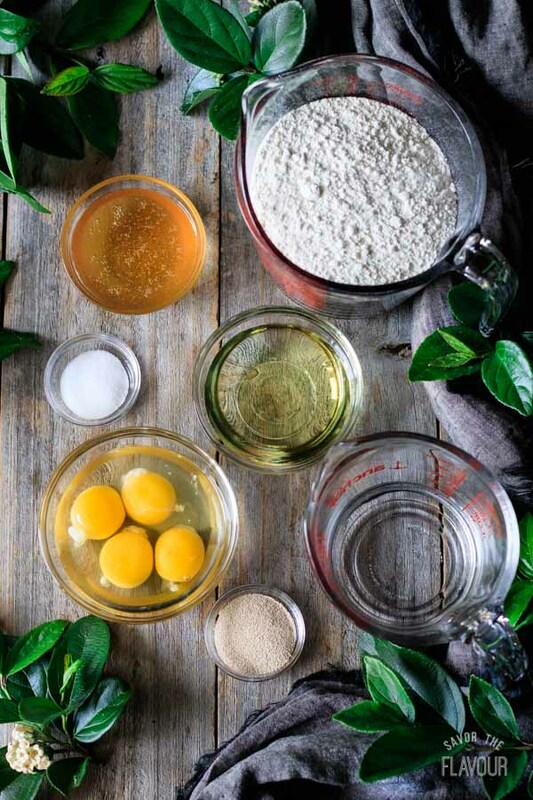 Gather the ingredients: bread flour, eggs, olive oil, honey, salt, yeast, and water. Add the eggs, honey, and olive oil. Mix with the paddle attachment on low speed until blended. 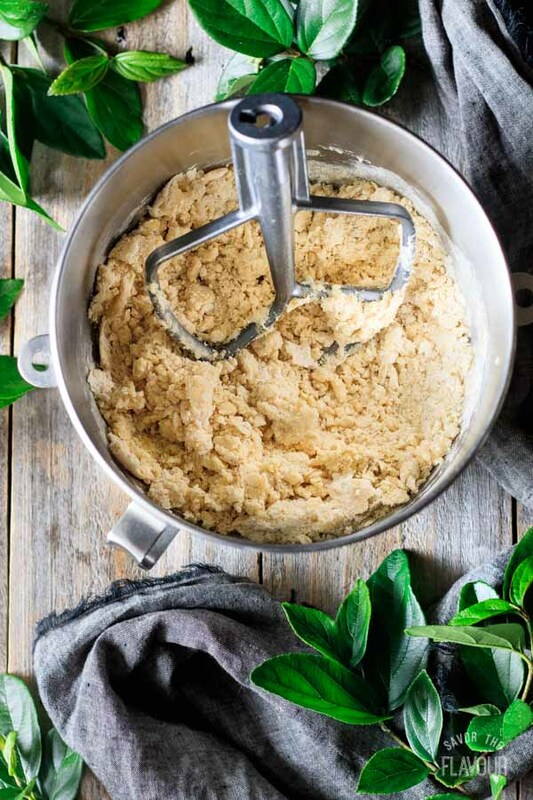 Gradually trickle in the water while the mixer is running until a sticky dough has formed. Knead by hand or with the dough hook on medium low speed. 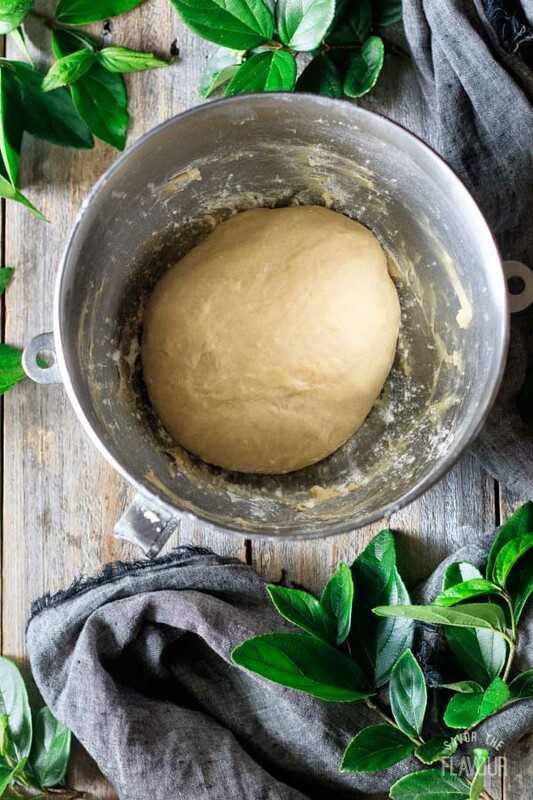 Place the dough in a lightly oiled bowl, cover tightly with plastic wrap, and set aside in a warm place until doubled in size, about 1 1/2 to 2 hours. If you lightly smack the top of the dough, it should fall back. Punch down the dough to remove large air pockets, then divide into five equal pieces, using a kitchen scale for accuracy. Roll each piece into a rope roughly 20 inches long. If the ropes are not rolling out easily, let them sit for a minute or two to relax the gluten, then try again. Aim to get all 5 pieces the same length and thickness. Place the challah on a parchment-lined cookie sheet, cover with plastic wrap, and set aside in a warm place until nearly doubled in size and springy to the touch, about 1 hour. Brush the loaf with a mixture of egg yolk and water. Stack the challah tray on top of another cookie sheet to insulate the base and prevent it from burning. Bake at 375 F for 25-30 minutes, until the loaf has an internal temperature of 190 F. Cover with foil after 10 minutes if it’s getting too dark. Let the challah cool completely on a wire rack before serving. Since challah bread doesn’t take a lot of ingredients, make sure each ingredient is good quality–especially the flour. It really makes a difference how your bread looks and tastes! 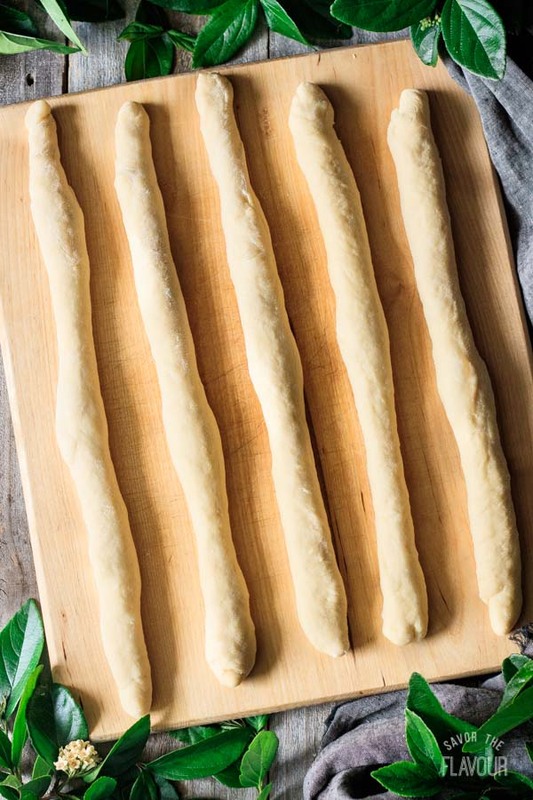 Don’t stretch the strands of dough as you braid them. This will make the loaf fat at one end and skinny on the other. Why is my challah bread dense? The loaf probably didn’t rise enough before it was baked, resulting in a dense, doughy texture. Next time, let the braided challah rise until springy to the touch and almost doubled in size before baking. Why is my challah bread dry? The loaf was most likely baked too long. Sometimes, it’s hard to tell when a loaf is fully cooked, so I like to use a meat thermometer. Poke it into the thickest part of the bread and wait a few seconds. It should read 190 F when the loaf is fully baked. Sweeten your day with these other delicious sweet breads. Kanellängd: Swedish Cinnamon Bread: it’s easier than it looks to make this swirly cinnamon bread. 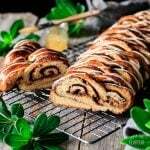 Pulla: Finnish Cardamom Bread: the Finns’ favorite snack to have with a cup of coffee. 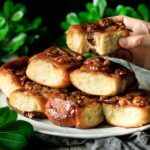 Maple Pecan Sticky Buns: wonderfully sticky, caramelly cinnamon buns that are freezer friendly. Did you make this challah bread? Please leave a star rating below the recipe to share how you enjoyed it. 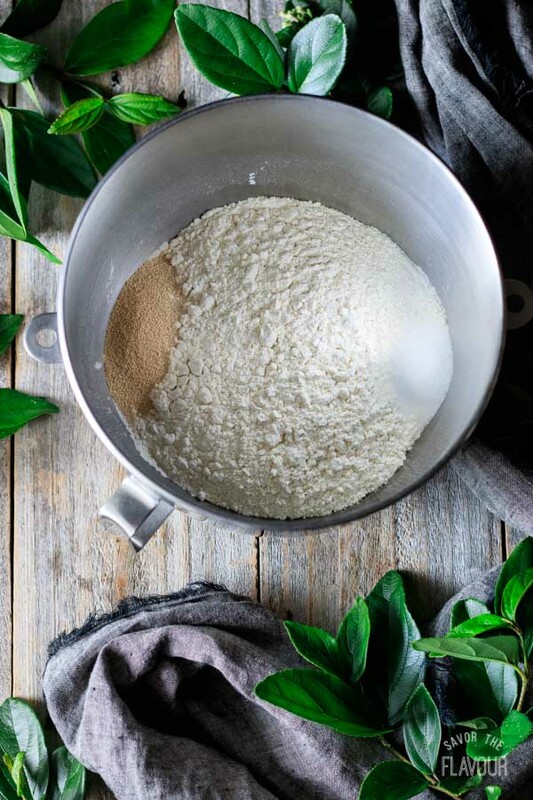 Warm the water to 115 F.
Place the bread flour in a large mixing bowl and add the salt and yeast on opposite sides of the bowl, stirring in each one with your finger. Pour in the honey, olive oil, eggs, and yolks. 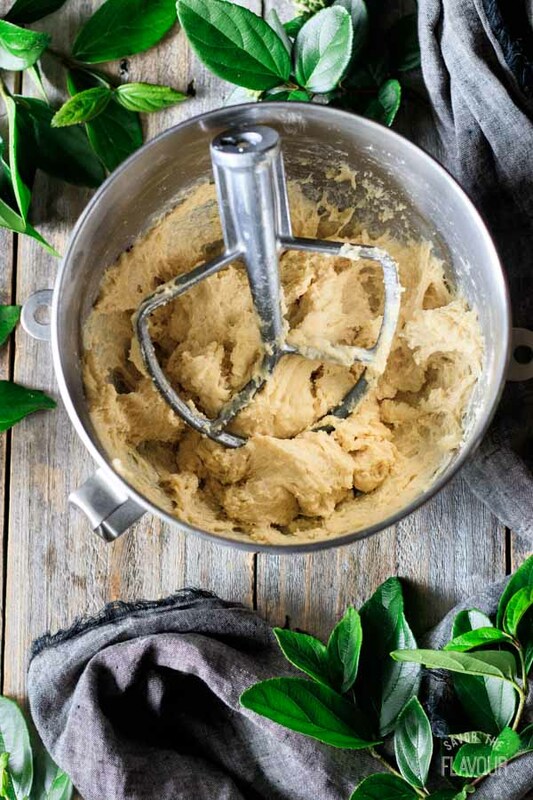 Gradually add the warm water as you mix on low speed with the paddle attachment of a stand mixer (or by hand), trickling in a little at a time to create soft, slightly sticky dough. You may not need all the water. Knead on medium-low speed with the dough hook for 5-7 minutes, until the dough is smooth, no longer sticky, and has a glossy sheen on its surface. You may need to add a spoonful or two of flour to get the right consistency. 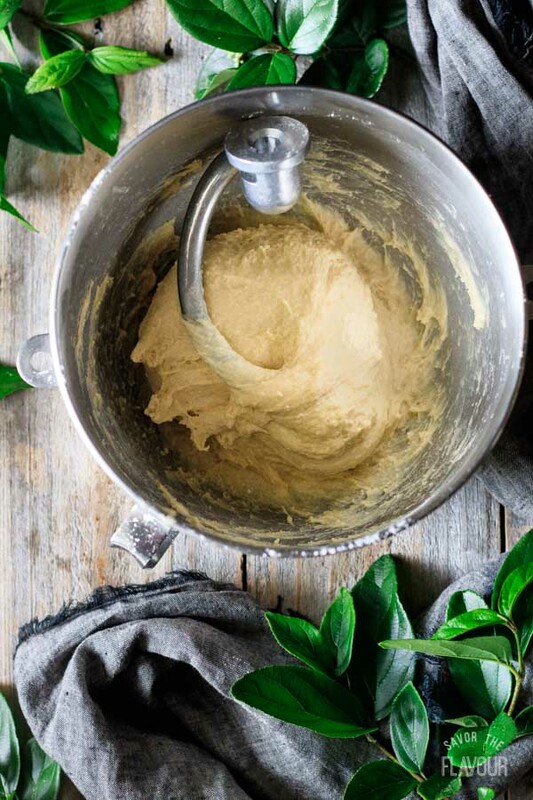 (Alternatively, turn out the dough onto a floured surface and knead for 10 to 15 minutes.) 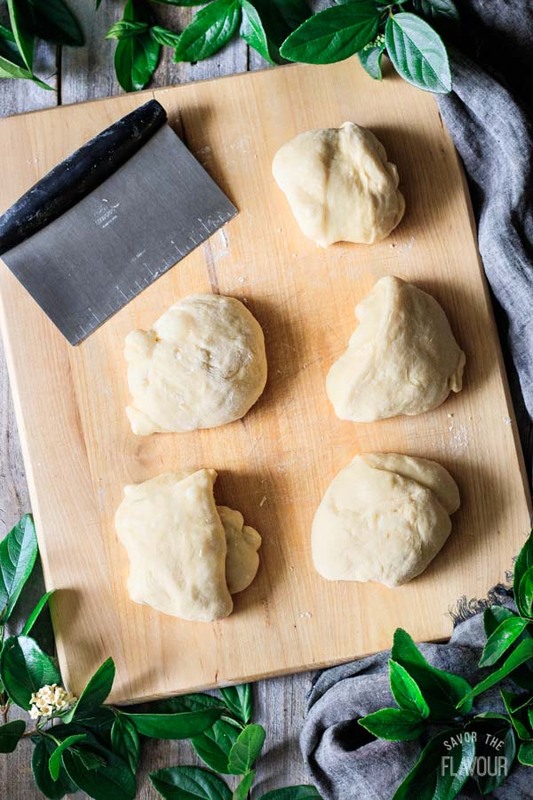 Use the windowpane test to see if it’s kneaded enough by pulling off a lump of dough and stretching it between the thumb and forefinger of each hand. If the dough can stretch until it’s translucent without breaking, it’s kneaded enough. If not, knead for a minute longer and check again. Shape the dough into a ball, place in an oiled bowl, and cover tightly with plastic wrap. Set aside in a warm place until about doubled size, approximately 1 1/2 to 2 hours. Turn out the dough onto a lightly floured surface and punch it down all over to knock out excess gas. Divide the dough into 5 equal pieces, using a kitchen scale for accuracy. Roll each piece into a rope about 20 inches long. If you’re having trouble rolling out the strands, let them rest for a couple minutes while you work on another strand. This will relax the gluten, allowing them to roll out more easily. Line up the 5 ropes side by side, then squeeze them together at the top to join. Split the strands into two groups: a group of two on the left, and a group of three on the right. Begin the braiding by crossing over the third strand from the second group and placing it beside the second strand in the first group. Then, cross over the first strand from the first group and place it beside the first strand in the second group. 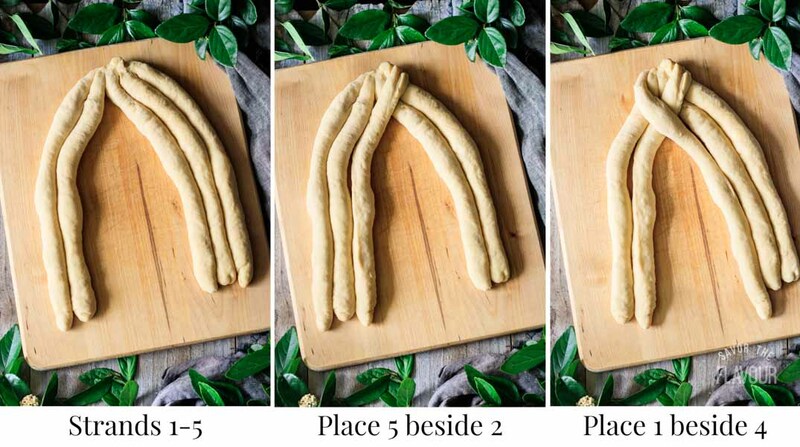 Repeat this process until the whole challah is braided, then pinch the ends to seal and tuck the ends underneath. Gently pick up the loaf and place it on a lightly floured 11 by 17-inch cookie sheet. Place the tray inside of a large, clean garbage bag and inflate the bag, tucking the ends underneath to seal. Let the challah prove in a warm place until doubled in size, about 1 hour. Beat the egg yolk with a little water to thin it, then brush it on the risen challah. Stack the tray of challah on top of another cookie sheet to help prevent the base from cooking too quickly, then bake at 375 F for 10 minutes. Check the bread without opening the door, and if it’s getting too dark, cover it with aluminum foil. Lower the temperature to 325 F and bake for another 15-20 minutes. The bread should be a rich golden brown and have an internal temperature of 190 degrees. Let the challah cool completely on a wire rack before slicing and serving to allow the crumb structure to set, about 1 hour. Serve with salt or butter. The pleasure of a 5-star review on this recipe would be much appreciated. Please leave your review in the comments section after the recipe. Wow! This bread is so delicious. And best of all it is very easy to make! It will definitely become a staple in our home. Place a heating pad on low around the bowl to help rise it in cold areas. Or microwave a towel till it warms and cover the bowl. Those are good ideas! Just make sure that the heat isn’t too intense–too much heat can kill the yeast. 🙂 Happy baking! First time making Challah and this recipe is as it’s named. Easy. Rising of the dough in the winter is a challenge. Any ideas? I agree–it definitely can be difficult, even though I live in a warmer climate. My favorite trick for getting dough to rise in cold weather is by using steam. Place the dough inside a cold oven. Put a metal pan on the shelf below the dough, and fill it halfway with boiling water from a kettle. Shut the oven door to keep the warm steam inside. Check the oven occasionally, and if it’s cooled off inside, simply dump out the old water and refill with boiling water. Hope this helps! Loved this recipe, very easy to make and very successful.. thanks! Thank you, Sallie! 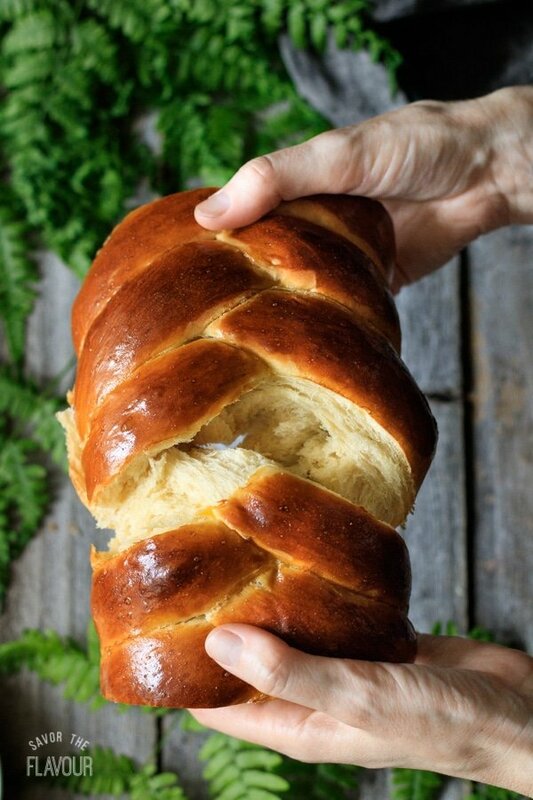 I’m so excited to hear that you made and enjoyed this challah bread! This was my first time making bread ever and this recipe was so easy to follow! The loaf came out beautifully and tasted sweet & delicious!